Dave Arnold is the Director of Culinary Technology at the French Culinary Institute. More relevantly to this space, he's also a mad scientist, with a strong mixological bent. Arnold said that in the late 17th- and early 18th-centuries, a popular drink in what would become the US was a "flip" (no relation to the slightly-more-common "flip" style of cocktail with eggs, a sort of a creamless eggnog.) A flip consisted of ale, rum or brandy and sugar or molasses. The bartender would heat a "loggerhead" -- a tool consisting of a long pole with a ball on one end and a handle on the other, originally used to melt pitch -- in the fire and use it to heat the drinks. These flips were popular roughly until the Civil War. After reading John Hull Brown's "Early American Beverages", Arnold became interested in flips and loggerheads, and decided to experiment with them. He first picked up some soldering coppers -- solid copper rods used in welding and soldering -- and heated them on the stove. Those infused a slight copper taste and "left little black flecks of metal in the drink", so they were unacceptable. He then built a small insulated box with a bendable heating coil inside, to warm a loggerhead-like poker...but that box got too hot: "We put a chicken heart in there, and it basically exploded." Vaporized poultry hearts aside, the iron poker also left a noticeable taste in the drinks. Next, he tried a high-temperature stainless-steel alloy, but that wasn't a terribly good conductor of heat, and it didn't heat the drinks with quite enough oomph. So finally, he settled on an internally heated rod made from an esoteric nickel-based alloy, and he hooked it up to bendable heating coils and all kinds of thermocouples and other gear to control and monitor the temperature. When he demonstrated it to me, though, the equipment was recalcitrant, and he fought with it: first having to find a way to run it without blowing a circuit breaker, then discovering a short circuit and re-soldering it in front of me. The fixed version didn't have a working thermocouple on it, so the digital temperature display wouldn't be reliable. The indefatigable Arnold would have to gauge the temperature by eye. 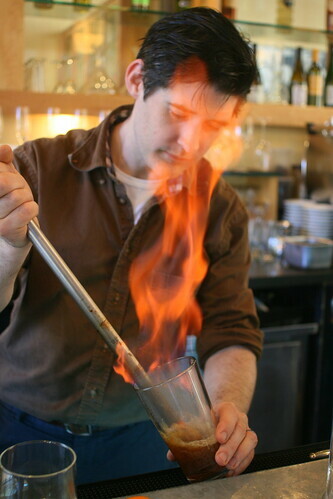 And monitoring the temperature is important: the Red Hot Ale cocktail he created ignites at 1700°F, the Red Hot Manhattan he also serves ignites at 1750°F...and the heating element burns out at 1800°F. Delicacy and a keen eye were going to be absolutely necessary. So he set to measuring out Ommegang Abbey ale, Courvoisier Cognac, a bit of simple syrup (since the poker's caramelizing effect takes some of the sweetness out, he mixes the cocktails a bit sweeter than usual), lemon juice, and some Regans' Orange Bitters, stirred them, and set them alight with the poker. The beer foamed wildly as he agitated the poker, and when it was done he set the finished drink in front of me. It was yeasty, toasty, and slightly sweet -- and it was wonderful and like nothing I'd ever tasted before. Next up was the Red Hot Manhattan, which he made with Sazerac rye, Dolin vermouth, and Angostura bitters. 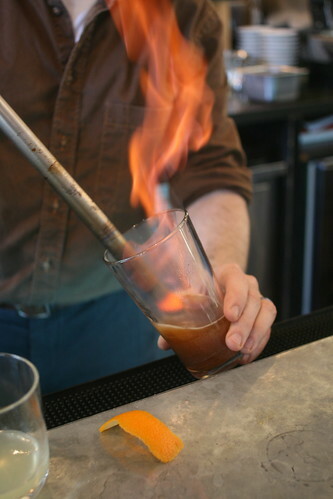 This time the flames shot even higher, and the resulting toddy-like drink was very good -- still recognizably a Manhattan, with noticeable sweet-vermouth notes, but with the feel of warm whiskey. After wowing me with the Red Hot Poker, Arnold then showed me another toy -- his rotary evaporator, or "roto-vap." Arnold uses it as a vacuum distiller, and infuses neutral spirits (el-cheapo vodka, filtered multiple times through charcoal) or other liquors with whatever he can think up. (Unlike the Red Hot Poker drinks, he can't sell the results at the French Culinary Institute's restaurants.) The low-temperature distilling infuses the flavors into the spirit with a great deal of presence; I sampled a caraway aquavit with a very forward rye-bread flavor, a peanut-infused Scotch that was fantastically fascinating, and even vodka and Scotch infused with hops. ("Hops-Scotch", of course.) The roto-vap removed the hops' extreme bitterness but left their characteristic flavor. I wish this stuff were more readily available...hmmm...perhaps I'll have to start trolling eBay for a roto-vap of my own. 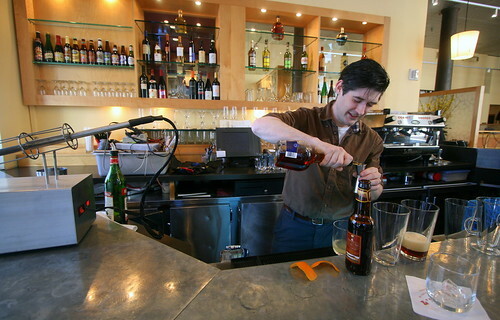 Arnold is working on opening a bar with pastry-chef pal Johnny Iuzinni of Jean-Georges, but until then, you can taste the Red Hot Ale and Red Hot Manhattan at L'Ecole, the French Culinary Institute's restaurant. Great photos! This looks as insane as it sounded when you were describing it last week. Sounds delicious too, I like that they're not just doing it for show. Le Sigh. Cool toys and great pictures. Wow, this guy is super interesting, nice post. I'm really interested to read more about the roto-vap. Hope that thing is sterilized once in awhile.